Walking out of the mediation session with a fully signed Memorandum of Understanding (MOU) tucked firmly into her canvas messenger bag, Angela Aingel felt elated that her divorce was close to finality. Of course, from deep down, she was reminded that she was divorcing the father of her children, someone who had once seemed the man of her dreams, but that was long ago. In her opinion, Art made Angela decide on divorce when he went back to drinking, putting his addiction ahead of everything, including his job, his health, the children and her. Once Art and Angela became immersed in the process of getting their divorce – getting their financial information on the table, dealing with the courts and experts, opening up their parenting skills and privacy to the Colorado legal system — she had found the whole thing expensive, overbearing and dispiriting. It seemed to her that it would never end. As far as she was concerned, the marriage had been “over” for years, and wanted closure and a fresh start. The agreements reached in mediation seemed to be the light at the end of the tunnel. The process of getting divorced would soon be over. That was more than fine with her. Angela was really glad she had her attorney at mediation. There were a lot of confusing facts, and the mediators were not allowed to give legal advice. More importantly, Angela had become frustrated and wanted to storm out on more than one occasion. Her attorney had remained calm and rational, helping her to press forward, even taking a break when needed without walking out. Even going over the details of the MOU, Angela had been confused about modifiable verses contractual maintenance. The attorney was there to explain everything and to keep her from making a mistake. Angela called her friend Desdemona DeVille to share the good news. “All we have left is to finalize the separation agreement and parenting plan!” Angela exclaimed, practically giddy. “Did you have an MOU?” Angela asked. Angela tried a bit to console her friend and then ended the call. As usual, after talking to Desdemona, Angela had the kind of scared-of-divorce-drama stomach ache that could only be resolved by a calming, quick consult with her attorney. Separation Agreement? Parenting Plan? Were these really enough to derail the divorce despite all the assurances provided by her attorney, the mediators and the MOU? To make matters worse, Angela woke up the next morning with a case of cold feet. Why had she settled the case? Maybe she could have done better at trial. Despite Art’s drinking, she had agreed to give him a significant amount of parenting time. What happened if he drank in front of the children?! Angela decided that a phone call would not due. She wanted a face-to-face meeting with her attorney. The attorney agreed this was a good idea, saying she wanted Angela to go over the Parenting Plan and Separation Agreement line by line with her before signing them. “They are done already?” Angela asked. Things were suddenly speeding right along. Angela had seen the form JDF 1113 Parenting Plan and form JDF 1115 Separation Agreement online. In fact, her attorney had asked her early on in the proceeding to complete them in order to think about what she was seeking and to guide the negotiations. The document her attorney had her review after having settled in mediation was completely different, however. It was a fully typed document in 12-point Times New Roman print, just like all of her attorney’s documents. The check boxes were gone and instead, there were paragraphs with headings and detail. 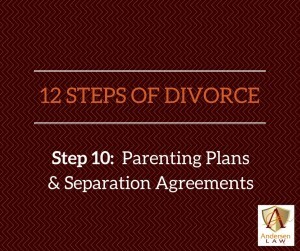 Everything had been combined into one document entitled Separation Agreement and Parenting Plan. Angela sat at a desk and went over the documents, marking all her questions and things she wanted to change. She was surprised that she caught a couple typographical errors her attorney had not seen. Between two attorneys, Angela had assumed even a first draft would be typo free. But her attorney said that she was doing some of that detailed review at the same time. Both attorneys had agreed to meet with their clients at the same time in hopes of finalizing the documents and getting them signed that day. “But we are not in the same room!” Angela protested. Her attorney said this was fine. They could each sign separately and the documents would be combined. Angela’s cold feet warmed up a bit as she read the new documents. They addressed some of her concerns. For example, they made clear that the parties would go back to mediation if they did not agree in the future. And they made clear that Art would have monthly alcohol tests. I like that part about the alcohol testing, she told her attorney as they went through the agreement line by line. I am glad he agreed to it! Sure enough, Art refused to sign the provision about monthly alcohol tests. Suddenly, Angela’s cold feet were getting darn hot, along with the rest of her. What if Art ruined everything and refused to sign? Off to trial they go. This calmed Angela. In fact, she had known it all along. It’s just that she was getting confused with so many things to talk about. At mediation, she felt done, but now it was just more negotiating. She was getting worn out by it. On the other hand, she did not like that Art insisted they divide all the children’s expenses 50/50. That was new. They had not addressed this issue in the MOU, but she wanted to divide it in accordance with their incomes. Even with child support and maintenance, Art’s income was sure to be higher. Going through their attorneys, Art and Angela went back and forth and back and forth on this issue. When Angela’s attorney got out her calculator and showed how much money would be at stake, however, Angela realized that it would not be that much money in the long run. In fact, Art and she were paying more in attorney fees to quibble over the issue than the money at stake for the year. Angela was not even sure if this was true, but she nodded her head to be polite, if nothing else. Art’s attorney proposed a 55/45 split of medical fees. Angela countered with 60/40 and, like that, they were done. Angela found it boring and tedious that her attorney made her look over the agreement AGAIN line by line, explaining the paragraphs in addition to Angela reading it. Angela did not want to do this, but her attorney insisted, saying that this way she could report that she ALWAYS did this with every client. She said she had clients tell her, after having settled under the counsel of another attorney, that their attorney “made them sign” or “threw a bunch of papers at” them so that they “did not even know what” they were signing. Angela’s attorney never wanted to be in such a position with her clients. Sure enough, when Angela read through again, there were a couple of things she did not understand. “What is this Rule 70?” she asked. The attorney explained that meant that if the other party did not sign something, you could take the document to court and have a clerk sign it. There may be a hearing on the issue but it did help execute the agreement if one party did not sign. Finally, all was explained and Angela signed. Art signed too. The papers were filed that day along with a proposed Decree Of Dissolution, Affidavit For Decree Without Appearance Of The Parties and Support Order. Angela went home and fell into bed, exhausted. Throwing a frozen pizza in the oven for the kids and declaring it a Netflix night, she was soon sound asleep and dreaming of herself floating through the clouds, looking down at an uncharted landscape. The New World. Angela was shocked. Already?! But on the other hand, she felt relief. The thought of going to court put her stomach in knots. And the attorney fees were something she would be glad to stop paying. Done was done, and she was ready to move on. Her phone immediately rang. “OMG girlfriend. You did it! I am totes jealous,” Desdemona gushed into the phone. “Let’s go get a celebratory chai latte,” Angela suggested. “You, I would guess,” Angela answered. Her attorney had told her that the two parties usually were the main witnesses in a hearing. “Oh sure,” Desdemona said, a wink in her voice. Angela could not believe it. Her divorce was barely done and she was already getting dragged into her friend’s divorce. Angela gulped. Maybe Art and she could let cooler heads prevail when it came to their own divorce, but they would never be able to persuade their friends to adopt the same standard. Meanwhile, Angela’s ex-husband Art Aingel was on the phone with Desdemona’s soon-to-be-ex-husband Draco DeVille. “You are such a buzz kill ever since you got divorced,” Draco pouted. “Well, actually, my friend, I can do exactly that. Because, unlike you, I am divorced!” Art was smiling into the phone as he spoke. As much as it saddened him that his marriage had ended, Art was pleased not to be in Draco’s shoes. Divorce was hard enough without dragging it out. Staying up all night to get ready for a hearing did not sound fun at all. Questions for November: Prove it! Who will be your witnesses? What is a Joint Trial Management Certificate and why must you do one? What goes in your trial notebooks? Are you ABC or 123? Exactly what happens at permanent orders?